applications are accepted for this Udupi Anganwadi jobs from 30-07-2018 to 23-08-2018. Official website to apply online is http://anganwadirecruit.kar.nic.in/. Candidates who are qualified minimum 4th class and maximum 9th class they are eligible to apply online. Candidates have to apply for their own village or municipality or ward. Candidates selection is based on documents verification for this Udupi District Anganwadi Helper, Anganwadi worker jobs. Details information about this Udupi Anganwadi jobs are given below. 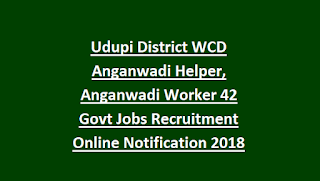 There are total 42 jobs in this WCD Anganwadi Udupi District recruitment. Candidates must have qualified 4th class for applying these Anganwadi Helper vacancies of Udupi district. For applying online candidates must have age limits of 18-35 years. Age relaxations are applicable for reserved candidates. Candidates selection is based on personal interview and documents verification for this Anganwadi jobs of Udupi district. Candidates must be belongs to same village or same ward for applying this Anganwadi jobs. 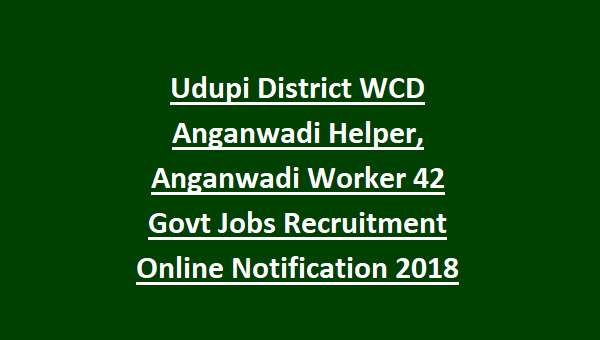 Candidates who are interested and within the age limits they can apply online for this Udupi District Anganwadi Helper/Worker jobs from 30-07-2018 to 23-08-2018 through official website of http://anganwadirecruit.kar.nic.in/.